Every year I toss around the idea of gift guides on the blog, but this year I decided to just join the noise, but offer things in my own taste. I get quite a few emails and comments about gifts especially for the man in your life so I thought I would share what is on my list of ideas for Mike for Christmas. The older I get the less and less I really appreciate the whole gift giving part of Christmas and honestly find it all taking away from the beauty and wonder of the holiday season. The last few years I honestly have found myself most happy with the idea of a great brunch, a good cup of coffee, and then to enjoying some good old family time. Truly I have been dreaming of a beautiful get away in a cabin in the mountains for Christmas instead of any actual gifts. Sounds far more relaxing and less stressful than the process of gift giving. Honestly I get pretty stressed by it all. I also hate thinking someone is stressed about what to give to me. Anyways, this year Mike and I are each choosing 1-2 items for each other and telling family we are simply okay with 1 nice item each and nothing more. That being said I have a list of items I put together with some of my favorite man things I have seen lately. Any 1-2 of these items could be perfect for Mike and so they should definitely inspire you to find that one super awesome gift for your favorite man in your life. 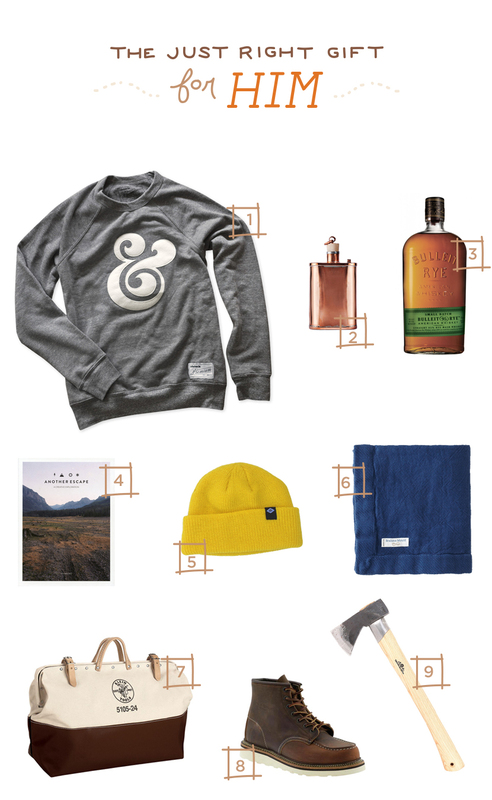 Here are my top picks for the man in your life this year. Hope this inspires that one PERFECT thing to let him know you love him mucho, then go for a long wander in the snow and drink some hot cider and play some family games! 1. A Hip Sweatshirt: The combo of backwoodsman and street wear is getting pretty big these days. I love this sweatshirt from Ugmonk with a giant ampersand. It says design geek without the design geek humor. 2. Every Man’s Flask: It is true, no man should be without a good flask. I believe there are certain things that each man should have and should have them quality enough that they can hand them to their boys later in life. A flask is one them. A flask will hold stories that only come from manly adventures, things most ladies don’t get to hear. With handing down heirloom things you also get to hand down the stories as well. That’s a beautiful thing and why a good flask should cost a little more. 3. Whiskey: A good whiskey selection should be kept on hand for every guy. Pair the flask and a great whiskey like Bulleit Rye Whiskey and you have a great present for any guy. 4. Adventurous Stories: Give a good collection of great reads and stories. I recently came across Another Escape and I just know this would be great for Mike’s collection. 5. Hoppin’ Hat: During those wild adventures it is key to have a hat to not just keep you warm but to keep you stylish. The ones from Clyde Oak are my fave right now. The orange will be coming out very soon, for now the yellow has my heart. 6. A Sturdy Blanket: Men like to be tough, but when it is chilly outside they are just like us ladies and want to curl up near a fire just as much as us. They will complain about our throws so give them a good blanket, the kind that will age with them. This one should do the trick. 7. The Tool Kit Weekend Bag: For those guys who want to be manly enough to know how to use tools and have a tool bag, but really have no clue how to own tools so instead they use that bag as a weekend bag…works for me. This one is a great classic and original alternative to the hip ones on the market that break the bank. 8. The boot to end all boots: You may have seen many cheap versions, but the Red Wings are the tried and true and no man should live life without a pair. They will take them many places and be worn in many important occasions. They will wear better with age. I grew up seeing the many pairs my father owned as a carpenter. So many memories with that brand. 9. The Swedish Axe: Mike recently got one of these this year and I talked about it during our #wildweekend, but I honestly believe every guy needs an axe….a good one. Even if it simply is a safety item in the back of the car or if it will be something they use daily to chop wood. Every man should have one, I highly suggest this for any guy. These are beautiful and HIGH quality axes…the swedes don’t mess around…we know that. How do you plan to do gifts this year? Do you all also find the holidays kind of stressful? I always feel they should be relaxing…right?! Great list! My dude could use a pair of boots like that. the tool kit weekend bag is perfect! I’m loving that tool kit bag! So unique and definitely doesn’t break the bank! These are great gifts and my husband would love any item since they are all camping related. We usually don’t do gifts and treat ourselves on a short day trip a few hours away instead. I love spending time in another area and discovering the local flavor.